The Internet of Things (IoT) is becoming more and more interesting and important to developers and hobbyists alike. Imagine a decade ago being able to buy a complete WiFi-enabled computer for less than $10. The future looks bright for even less expensive modules as competition starts to move into this market. The IoT is a network of physical objects that contain electronics, software, and some kind of network connectivity (e.g., WiFi, Bluetooth) that allows these small, sensor-laden devices to collect and exchange data and, in some cases, do things in the physical world. Some of you might know that I'm also writing a book, and one of the cool projects I've included is called LightSwarm, which comprises five ESP8266 independent, small computers, all talking among themselves to decide who has the brightest light shining on it. It is a self-organizing swarm with no server – just peers. They send their status to peers and receive data, and the one with the brightest light becomes the master and turns on its small red LED to show who has the brightest light. All the decisions are logged to a Raspberry Pi, which has no control; it just gathers information about what is going on in the swarm. A single LightSwarm element is shown in Figure 1, and Figure 2 shows the whole swarm and the Raspberry Pi. It sounds simple, but whole forms of behavior arise from the swarm. Additionally, the swarm is designed to be resilient, even when swarm elements drop into and out of the network. Figure 1: Individual ESP8266-based swarm element. Figure 2: The Complete LightSwarm. 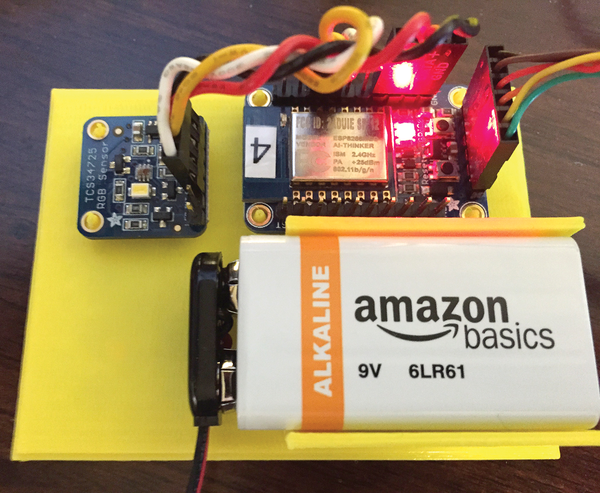 We take an inexpensive ESP8266 WiFi/processor combination and turn it into a solar-powered device. 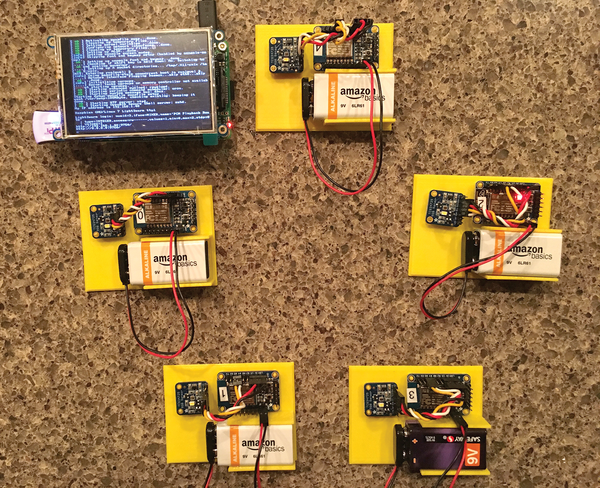 The ESP8266 Wifi chip can be used for measurement applications wherever the capabilities of the Raspberry Pi are woefully underutilized. In sleep mode, this microcontroller uses less than 3.3 milliwatts and costs only 6 Euro. We create a micro web server on an Arduino and a Raspberry Pi, and then use a PSP web browser to control an airboat. Take a Presentation Machine slide show clicker from wired to wireless.